Niger seed is that tiny little oil rich bird feed that is known for attracting finches and being a great source of energy. However just like with bird peanuts, there is a bit more to it than that. Now we’ve gone with niger, like the East African country. But similar to how that country has a rather odd flag, in that it’s more or less a square, lovers of niger have come up with some rather odd spellings. There’s nyjer, nijer and nyger which is in fact a trademark of the Wild Bird Feeding Industry – though how well that trademark is enforced is up for debate. As long as you go for something like the above, you should be understood. Goldfinches, who are the main lover of niger seeds, will also eat thistle seeds. It is believed that in an effort to make the seed more marketable, bird feed suppliers of the past simply marketed niger as thistle. This is because the plant that tiny little seed creates, isn’t always that popular. But while we’re on the subject of what finches love, let’s make something else clear. Niger seed is around 18% protein and 35% fat, and because of that, it’s not something you’d want to pass up on if you’re a bird. It’s the avian equivalent of a superfood! Siskins, common redpolls and even birds such as nuthatches have been known to eat the little black gold. There is one creature though, that many of you will happy doesn’t eat niger. Those furry little balls of super cute fur sure are adorable, but in the eyes of many, squirrels are pilfering thieves. When you put out feed for birds, it can often be taken by big tailed interlopers, however you needn’t worry with niger seed. On the whole, squirrells tend to ignore it, perhaps due to its size. Niger is of course, tiny, but it still has a shell. As a result, you might sometimes think that the birds aren’t eating your offering, as the shell could be all over the ground. If you’re ever worried about sprouting though, most niger is either cut or sterilised, so it shouldn’t be an issue. Niger is an oily seed, which is why birds love it so much. With that in mind, it can dry out, and when that happens, birds will take a look at it, and then turn their beaks the other way! If you put out a sensible amount at a time, you won’t have to worry. 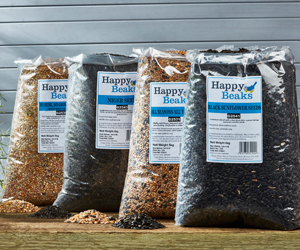 If you store your bird food properly, you shouldn’t have an issue, but niger seed can go mouldy, just like any other feed. You want somewhere cool and dry, and once opened, your high oil feed should be stored in an airtight container. Like when combating dryness, put sensible amounts of feed out at a time. Niger seed is tiny, so if you use a standard feeder, you will end up with a lot of mess. This is because the teensy tiny seeds won’t “block” the feeding ports, and gravity will takeover, resulting in a niger-avalanche. Luckily, niger feeders not only exist, but come in many different sizes too.